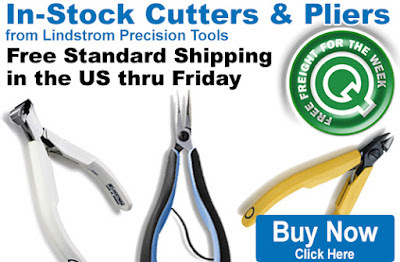 Get Free Freight on In-Stock Lindstrom Cutters & Pliers. Receive this discount when you add an eligible tool to your shopping cart. Our Free Freight promo is valid Monday, July 10, 2017 and runs through Friday, July 14, 2017. Eligible tools include cutters and pliers from the Supreme, 80, and RX Series; a selection of ESD-safe and standard models, various cutting gauge capacities, and various cutting types, head shapes, and lengths. For complete details, please visit each individual product page. Click here to shop for Lindstrom Cutters & Pliers. For further questions, call us (800-966-6020), or send us an email. Please note: This promo is valid only at QSource.com and expires on Friday, July 14, 2017.